Acer today announced two new 27-inch Predator gaming monitors that infuse the gaming experience with stunning visual clarity, vibrant colors, and remarkably smooth performance. The Predator X27 takes gaming to a new level with NVIDIA G-SYNC HDR at 4K resolution with a lightning-fast 144 Hz refresh rate, while the Predator Z271UV sports an 1800R curved panel and eye-tracking technology for intuitive gameplay. Both monitors leverage Quantum Dot technology, offering a wider color range with higher brightness, deeper saturation and better accuracy to offer dramatically more vivid visuals with the Predator X27 supporting 99% of the Adobe RGB color space, and Predator Z271UV covering 130% of the sRGB color space. With a Quantum Dot film that is coated with nano-sized dots of various types that emit very specific colored lights, the new displays can produce a wider color gamut compared to standard monitors, increasing color purity and efficiency. Acer’s Predator X27 portrays astonishingly vibrant visuals without motion blur thanks to a high 4K (3840×2160) resolution at a 144 Hz refresh rate, a fast 4 ms response time and a 1,000 nit peak brightness. Featuring Acer HDR Ultra technology, it offers the best possible contrast quality of the high dynamic range with advanced LED local dimming in 384 individually-controlled zones that shine light only when and where it is required. It not only delivers a broader, more deeply saturated color gamut, but a luminance range several times greater than that of traditional dynamic range monitors. By dimming the backlight behind parts of the screen displaying black, blacks appear deeper and darker on those parts of the panel, a significant bonus for people who play games with darker scenes. The chiseled diamond cut, all-metal stand is very robust to provide stability and ergonomic with adjustable tilt, swivel and height. 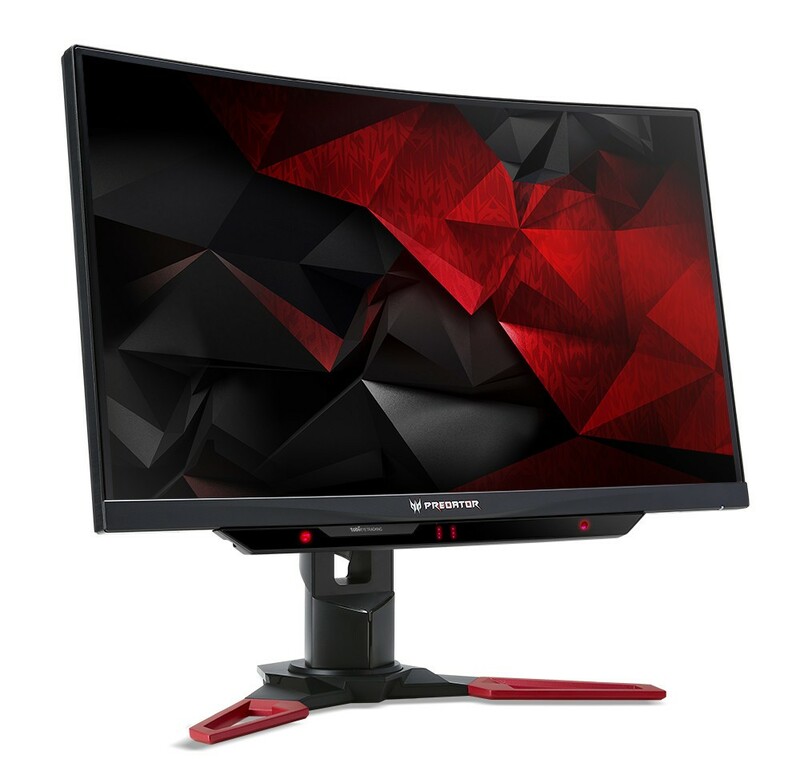 Acer’s Predator Z271UV provides WQHD (2560×1440) resolution on a curved 1800R panel that puts every corner of the screen at the same distance from the gamer’s eyes – this creates more immersive gameplay with a wider field of view and increased perceived area of peripheral vision. It features a ZeroFrame edge-to-edge design perfect for use in multi-monitor setups, and provides spectacular color breadth covering 125% of the sRGB color space. It’s extremely fast with up to a 1 ms (3 ms native) response time that nearly eliminates motion blur and supports overclocking up to 165 Hz. Built with ergonomics in mind, the display can tilt – 5 to 25 degrees and swivel +/- 30 degrees, while the height can be adjusted up to 4.7 inches. Connectivity includes DisplayPort, HDMI, audio-out, and USB 3.0 x 4 (1 up 4 down). Two 7 watt speakers deliver high-quality audio with Acer TrueHarmony technology for dynamic entertainment effects. In addition to Quantum Dot technology, both monitors boast NVIDIA G-SYNC to deliver tear-free performance, while NVIDIA ULMB provides sharp, authentic visuals. Integrated Tobii eye-tracking technology is intended to complement a traditional keyboard and mouse as the camera automatically rotates as the gamer focuses on the sides of the screen. Pairing eye tracking with mouse and keyboard or gamepad controls offers a richer, more immersive gaming experience as gamers are able to mimic actions that occur in real life, such as ducking for cover or aiming at a target. The new displays provide wide viewing angles up to 178-degrees horizontally and vertically. Furthering comfort, Acer VisionCare with Flickerless, BluelightShield, ComfyView and low dimming technologies which may help reduce eye fatigue during long gaming periods. Predator GameView lets gamers make precise color adjustments, set up aim points for hip-fire accuracy and adjust dark boost levels for more clearly spotting enemies. Custom settings can be saved in three different profiles including action, racing and sports, for switching between scenarios at any time during gameplay.